Your best work does not come from your ego: it survives in spite of it. To be serious about your craft and the outcomes of your efforts, focus instead on your work methods and allow the self to become small. Just as master chefs treat their kitchen, their methods and their menu, so too must you with your studio, your process and your product. To better illustrate how this works, consider how restauranteur Daniel Boulud concludes his book Ten Commandments of a Chef: each one resonates with anyone who is in the business of being creative. Your thinking must remain sharp, but that means far more than filling your head with facts. Sharpness of thought is much more about agility now. We underestimate how much our world is changing. We’re networked now like bees in honeycomb rather than tethered to the world by a single telephone line. Performance is rewarded best now for being adaptive rather than predictive. Empathy defeats self-centeredness. And yet we carry around this brain that’s still hardwired for hunting sabretooth tigers. Make regular exercise out of the notion that your assumptions about the world might not be correct. Notice how this is framed. It’s not about surrounding yourself with people who are just as good or just as talented as you are. In fact, how good you are doesn’t even enter into this equation: look for excellence in others and they will seek it in you. This is my least favourite item on the list. If I define my station as my work desk, then I have a lot of orderly work to do. But if I see my station as my MacBook Air and the flow I count on to generate clients, ideas and products I’m proud of, then I’m doing ok. Or maybe I’m engaged in a tiny bit of sophistry here just to get out of cleaning my desk. This has been a steadfast rule of mine for over 15 years. And I learned it from tradespeople: any tool directly linked to your ability to turn work into money is a tool you cannot afford to cheap-out on. A subset of this rule: own only what you need, not what you desire. I’m selective about what I keep: I sell or give away what I no longer use. Chefs know that seasoning doesn’t define but accentuates the dish. Writers know that adverbs and adjectives are like salt: there’s a fine line between enough and too much. Designers know that their best work happens when their product is made more understandable without explanation or ornamentation. Consultants know the hazards of over-explaining and that sometimes you have let an idea simmer with the client for a bit. It’s all seasoning. Know yours and use with care. Fear is fire. Learn to cook with it. And don’t let it burn you. You’re doing it wrong if owning a business doesn’t scare you from time to time. I would have put this one closer to the top. If you choose to make a career out of creativity, you have a responsibility to yourself and to everyone you serve to have well formed, thoughtful opinions on your tools, processes, influences and choices. Learning your world means you know exactly why you do what you do. That is the trademark of mastery. If you’re anything like me, when you were young you assumed classics was just another world for old. Look around you: most things do not survive even 100 years on this planet. The rare things that do teach us two things: having a good sense of taste is a timeless trait, and any problem you struggle with today someone long before you also had…and had the good sense to write it down. This gets easier as you get older and realize—paradoxically—that the more experience you gain, the less you are sure of. That’s not an excuse for being thin skinned when you’re younger. You only own the first draft of what you do: after that, it becomes something that’s beyond you. There are two ways that ideas can be polished. First, through self-criticism and self-reflection. Second, by welcoming a process that allows your work to be challenged by having it bump up against the opinions, beliefs and biases of others. This is why my newsletter, CreativeBoost, exists. It is as much a travelogue as a record of what’s new to me. Keeping track of what you’ve learned is as much a gift to your readers as it is a letter from the past to your future self. I’ve been following Richard Florida’s work for a number of years since The Rise of the Creative Class. In this presentation (see below), he makes several excellent points about the growing role and value of creativity today. With parallels to the 1930s and earlier eras of hardship, the rush of new ideas and finding a better way of doing things tends to come about most often when a society’s back is against the wall. It’s when rules get broken that people start doing interesting, daring things. This isn’t just executive-level challenge. Real creativity—the kind that makes things, and makes them better than before—has to take root in every level of an organization. No, don’t do that. Don’t run away. Don’t let it scare you that I just name-dropped one of the giants of jazz. Or that Coltrane’s music seemed complicated. This post isn’t going to preach jazz to you. And the jazz police aren’t going to show up and arrest me for having the gall to use America’s finest art form as a platform to illustrate an important point about the power of audience building. There’s valuable insight in here even if jazz isn’t your thing. As a reader of thinkit creative, you could be here looking for advice on search-engine optimized writing for the web to generate online traffic and convert readers into buyers. Maybe you’re a writer looking to build a base of readers. Or perhaps you’re a professional speaker or you own a design studio and you’re looking to take your business to the next level of profitability. Odds are good that you’re in the idea business. And that means your success hinges on finding and building an audience. John Coltrane can help you with that. Even this giant of music started without an audience. As a young musician, John Coltrane loved how saxophonist Charlie Parker wasn’t afraid to be playful with his music. He emulated what he heard. Not as a cheap cut-and-paster of style. 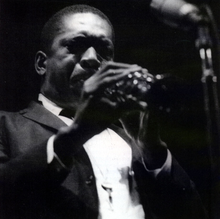 Rather, his drive to decode Parker and other influential players became part of young Coltrane’s relentless practicing. Biographies on the man often quote fellow musicians who knew him early on, saying they’d never seen anyone put in the hours the way Coltrane did. Out of the hours came the admirers. From the admirers came the listeners. And then the big breaks, like when he was invited to tour with the first time. Then the audience took hold and the Coltrane legend grew. It’s hard to imagine any of that happening in Trane’s career without the roots of discipline being as strong as they were. Groundbreaking ideas rarely find their audience quickly. It starts with thinking deeply about your audience and having as much of an understanding of what they want as what they might also be open to. Research will help you, but only up to a certain point. Intuition goes well beyond calculating a market penetration or measuring the size of an audience. There’s a deeper art. And you only get to exercise that by trying and by experimenting based on a mix of what you know is true and on a hunch you have about what might be true. Coltrane learned the hard way early on that masterful technique alone doesn’t win many ears. In fact, more than one audience in his career booed him for doing just that. He learned that ideas—especially the big ideas—have to be presented in a way that are pleasing to others. Often that means taking the time to package your ideas attractively. One of Coltrane’s great achievements in the American songbook is what he did with his interpretation of the Rogers and Hammerstein classic show tune, My Favorite Things. The music says more than I can say in paragraphs about that. So have a listen. To find and build an audience, your idea or your message needs a platform. My Favorite Things was a platform for Coltrane that helped him bring big-headed jazz to a wider audience. So what’s your platform? It can be a blog, an ebook, a series of newsletter articles, or a presentation (to name just a few examples). Invest the time to design that platform properly. Hire a good designer who can help you build something that people will enjoy using. That’s the front door. It’s how you’re going to invite your audience in so that they’ll stick around and see what else you have to say. Mastery of any creative skill only comes from finding good influences and by putting in the hours to hone your skills. Work to emulate. This is how you learn how great ideas are constructed. Only then can your own voice emerge. Take chances and find ways to build entranceways for people to access even your edgy ideas with relative ease.